Canada? Germany? Poland? was the sequence Natalia was greeted by a street vendor who was trying to guess which country we were from. We were just across the Mexican border in Nogales and it was a bit surprising that he did not even try US. We decided to take it as a compliment. And we needed the compliment rather badly. Apparently we looked really sick. At least based on the frequency with which random strangers suggested we pay a visit to a pharmacy. Taxi and real Mexican food were also offered regularly but the most frequently we heard an assurance that they had what we were looking for. Quite frankly we were not sure what we were looking for. Not for drugs, and not for any type of souvenir, and not even for a dentist or a plastic surgeon. Mostly we crossed the border since the border was there to cross. And also we’ve read that Nogales is the safest of all the border cities. Not threaten by drug violence as Tijuana or Juarez. Well, the paranoid state department bulletin did suggest we suspend non-essential travel, but who believes the government. Going to Mexican side was amazingly simple. Apparently we looked like responsible and upstanding members of the society since no one even wanted to talk to us. I cannot even say we were waved across. We just pushed a button and the red STOP was replaced by the green GO light. It felt pretty much just like crossing the street. We looked around for confirmation that we really were on the other side. All the billboards were in Spanish, while north of the border they are bilingual. To tell the truth from American perspective it feels like the language, the metric system and decent food is invading from the Mexican side. The interstate 19 leading to Tucson is especially confusing. All the distances and exist numbers are in kilometers, all speed restrictions are in miles. It must be some kind of tactic to confuse and obfuscate practiced by the Arizona state. Nogales border crossing is a hole in the wall. Or a hole in the fence to be exact. The city is cut into American and Mexican sides. American side is clean, sleepy, empty. Mexican side is messy, colorful and full of energy. In a stark contrast to north of the border neighbor, there are people on the streets here. If Nogales were 80’s Berlin, American side would play a role of grayish communist East, and Mexican side would be funky freedom loving West. There is no wall in Berlin any more, but the wall in Nogales is being constantly upgraded. To the tune of 4.4 million per mile. Of course problem of illegal immigration and violence south of the border could be solved by legalizing drugs, restructuring American farming subsidies and enforcing labor laws. But politicians consider illegal immigration a very convenient problem to have - one that needs a lot of dramatic gestures during each election cycle. So this fence is not going anywhere anytime soon. After really good and inexpensive meal at La Roca (sopes carne, chicken mole, Azteca and tlalpeño soup, guacamole, margaritas and prices in American dollars) we decided to head back to the boring American side, where we left our truck and the rest of our earthly possessions. Despite my fears that also proved to be rather uneventful. Our passports were scanned and the border officer welcomed us back after a stroll as he put it. The real revelation was one short and stocky American in front of me carrying a plastic bag of Viagra packages. I finally realized why everyone was directing me to the pharmacy: it’s not like I look sick, I just look like I could use some help. So we are wiser now. A fence wasn’t build to keep Mexicans out. It’s there to prevent American retirees, flocking to Arizona for the winter, from overdosing on little blue pills. When you see the land covered by cacti: giant saguaros, stocky fish-hook barrels, sprawling prickly pears, thorny ocotillos, you see… pasture. At least when you are a 19th century rancher. It seems that for desperate owners of hungry cows anything greenish spells fodder. Never mind thorns that would make animal-rights activists cringe. 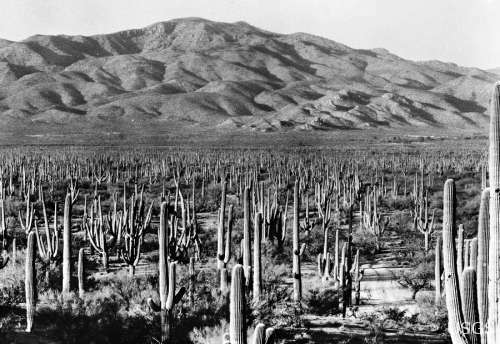 And forget about damage to the environment; if saguaros begin to die as result of your grazing practices all you need is a convenient theory: they wither because of unseasonably cold winters and there is nothing one can do. The idea that cows trample young plants preventing cactus forest renewal cannot possibly be true. These things tend to happen without any special planning. Pyramids, Easter Island Statutes or elaborate churches in the middle of Indian Pueblos. Civilizations that are on a verge of ecological disaster make this last stab at greatness and spend their meager resources on something completely impractical. If one admits that a culture can commit suicide this is surely a showy way to go. Well at least Pueblo Indians did not invent all those crazy ideas all by themselves. They were coaxed, convinced and threatened by Franciscans who arrived to teach and convert indigenous population. Scraping a living on the dry desert was always hard. Spaniards brought goods: metals, crops, animals - all seemed like an improvement. Accepting their religion might have been seen as a small price for all that bounty. And it’s not like there was any other choice.